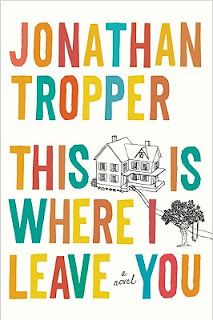 This Is Where I Leave You is Jonathan Tropper's 5th book and my first taste of his style, but surely not last. Judd Foxman recently caught his wife in bed with his boss. He has also lost his father who had been ill for a year so it is no surprise but no less damaging. Judd feels like he has lost everything. That is when he and the rest of his family are called home to sit Shiva for their father for 7 days. If you're not familiar with the Jewish traditional of Shiva, in short it is kind of like a wake but the closest family members have to sit on short chairs for a week staring up at everyone's nostrils while they repeat the same things to everyone who visits. This is a family comedy of errors as your learn who's sleeping with who, who has slept with who in the past, and who will be sleeping with who when all of this is over. There is a lot of sibling rivalry, but the love does show through despite most of the family's tough skin. The mother is especially entertaining and has a lot more depth than you would initially think at first with her augmented look, which leads to a lot of hilarious banter. I'm sure I'd be just as embarrassed if my mother got large breast implants late in life. The dialogue is what sets the book above most. Even the jokes don't seem tacked on, but exactly what this sardonic lot would be thinking. This is Where I Leave You is a very introspective look at what might have been as the characters run into people from their childhood. There is one story in particular that gets alluded to throughout most of the book that is shockingly blasé. The story flips between the Foxman's Shiva and Judd stumbling around, as he can't let go of his wife and former life despite the fact that he isn't sure he wants that life back. Equipped with an impressive family of characters full of sexual indiscretions, in fighting, and great banter this will surely not disappoint most readers. Deeply biting, emotional, and outrageously funny—you'll find yourself laughing on one page and tearing up on the next. This is Where I Leave You is book to keep handy for a rainy day and easily the best non-genre book I've read this year. I have absolutely no complaints on this read though the somewhat up in the air ending, which seemed very fitting may bother some. I give This Is Where I Leave You 9.5 out of 10 hats. I'll definitely check out Topper's work again as he has a bright future ahead of him. Topper could be the American Nick Hornby we have been looking for.